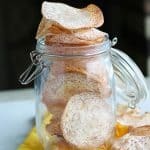 Taro Chips – Are you tired of the same old potato chips? 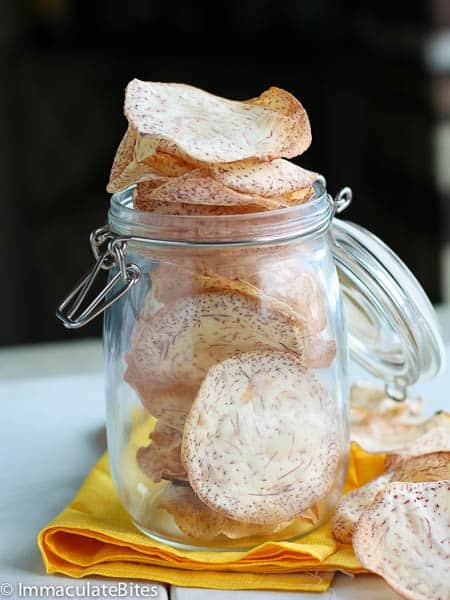 Then transport your self to the tropics with these taro chips and give your taste bud a jolt. 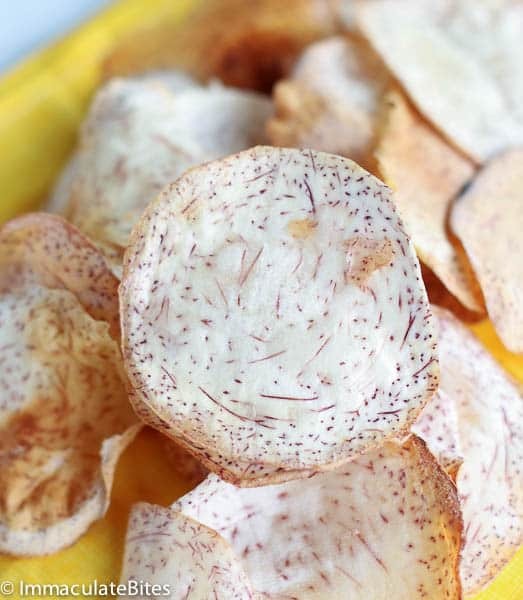 Yeah, you heard right – Taro Chips or some would call it Malanga chips. So what the heck is taro anyways? Let me do the honor . Taro is a starchy root vegetable that is known by other names eddo, kalo, macabo, dasheen, malanga, otoy, Otoe, cocoyam -depending on your country of origin. They belong in the carbohydrate family and are mostly found next to potatoes.You must have cross path with it in the supermarkets . It is hearty , with a staggering amount of dietary fiber and significant levels of vitamin A, C, E, B6, and folate, as well as magnesium, iron, zinc, phosphorous, potassium, manganese, and copper. It is also acceptable as part of a healthy and diverse Paleo diet and is use in place of potatoes in some countries. For more information on the benefits of taro check out THIS SITE HERE. 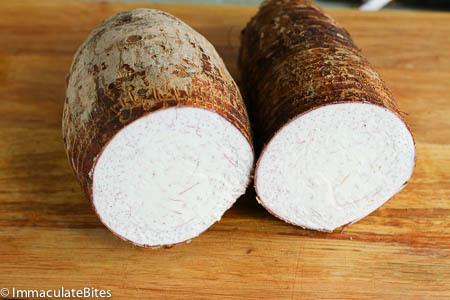 In West Africa, taro is boiled, roasted, and sometimes mashed and served with vegetables hardly ever fried. That’s because they say it itches the back of your throat if not cooked for a prolonged amount of time. There is definitely some truth to it. However, for some people no matter how long you cook it there is always going to be that sensation. In other parts of the world, in countries like America (specifically Hawaii ) Caribbean and Polynesian islands. They are often enjoyed as a snack – fried or baked- crunchy and flavorful. If you need something sturdy to scoop up dip this would be it. I love them both as long as it is crispy they taste good to me. To prevent your hands from itching soak they in vinegar before peeling them. There are different types of taro, use any variety you have on hand. Taro root does oxidize quickly, so work quickly and plunge your taro root into water as soon as possible. To ensure even cooking pair like shapes before baking or frying. Check in Asian, Hispanic and African markets if you can’t find it in your local supermarket. 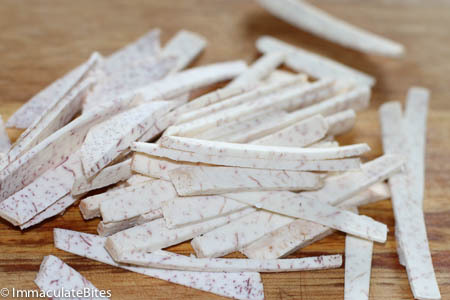 You can use a mandolin, peeler or knife to cut your the taro- be sure it is thin enough. You may have to divide the taro in to four so you can hold on to it. Soaking the taro in water for about 4 hours or overnight would help eliminate some of the throat itch. 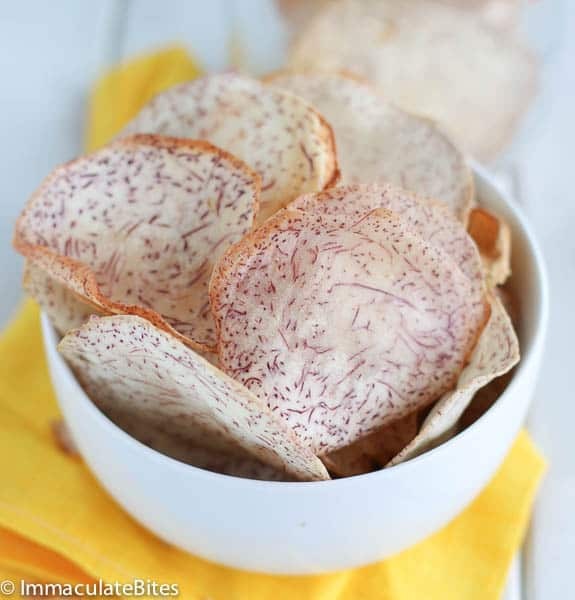 Transport your self to the tropics with these taro chips and give your taste bud a jolt. 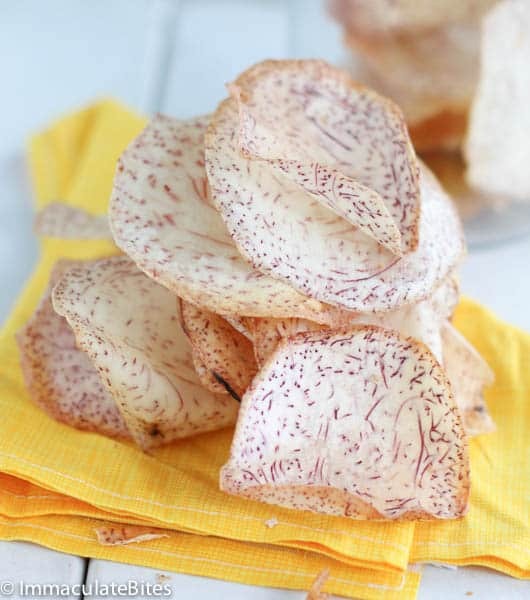 Yeah, you heard right - Taro Chips or some would call it Malanga chips. 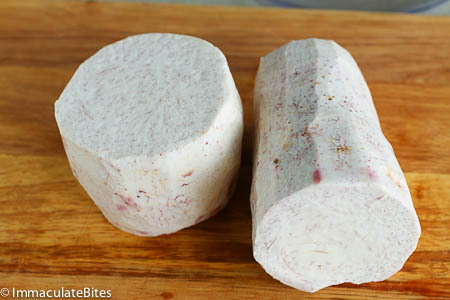 Cut taro into 2 -4 or larger chunks for easy peeling and cutting. Peel the taro with a sharp knife, peeling away from your body carefully draw the paring knife down the body of the taro, being careful not to remove too much of the taro during the process. You may use a potato peeler for this process if you have small taro. Look for any spoiled spots, such as bruising and discoloration, in the taro as you peel. Remove the spots away with the tip of the knife. Wash immediately to prevent discoloration and leave them in cool water until ready to use or refrigerate for up to 24hours. 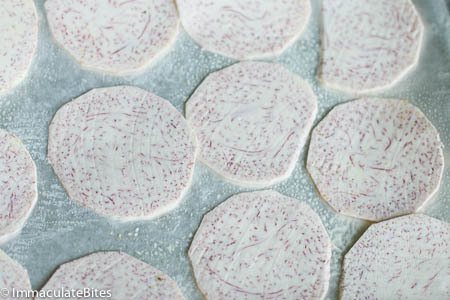 Slice the taro thinly with the help of slicer/ mandolin for consistent results or even use a peeler. 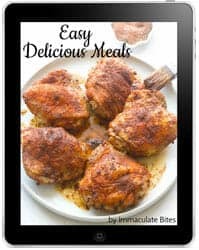 Season with garlic salt, Cajun spice or salt. Preheat the oven to 350°F. Line baking sheets with foil and coat with cooking spray. 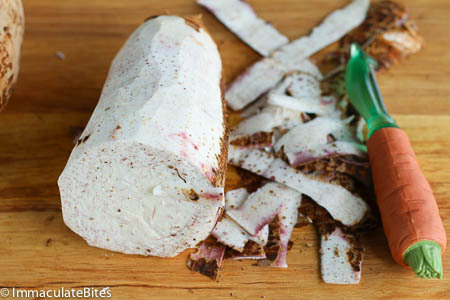 Place seasoned taro on baking sheets in a single layer, spray lightly over the taro bake for about 20 minutes turning over slices, after 10 minutes or till golden brown and crunchy. Serve warm or cool. Store in a sealed container. Heat up a large skillet or cast iron with oil up to ½ inch- medium-high heat until hot but not smoking. 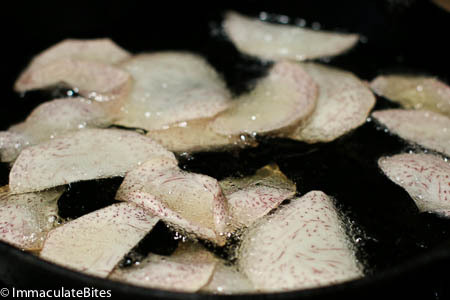 If using a deep fryer fry at 350 degrees F.
Use a slotted spoon; transfer the taro chips -drain on paper towels. Store in a sealed container or serve with corn dip or eat on its own. Hi Imma, these look great!! I love taro chips. 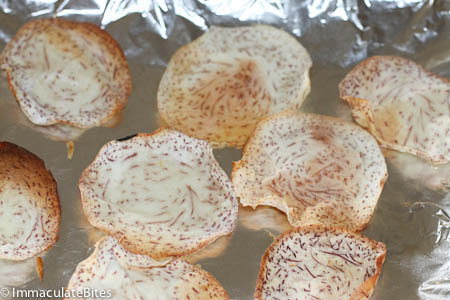 Just wondering…could I dry them in a dehydrator uncooked? Thanks for sharing this amazingly beneficial and healthy recipe, It has been a great help. Keep sharing and caring. It’s awesome. Excellent recipe! I fell in love with taro chips after finding them in a bag of mixed veggie chips but was never able to find them by themselves in California, so I took matters into my own hands. 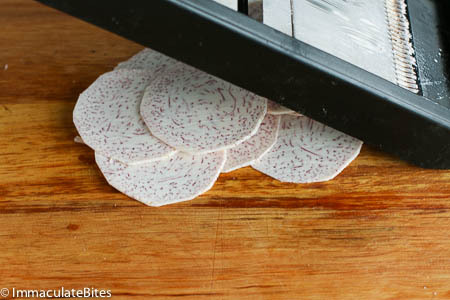 I like to buy the giant taro available at my local Asian market and slice them on a mandoline before soaking, which dramatically cuts down how long they need to soak. I still leave them in for an hour to be safe, but at 1/16″ thick they would probably be fine in as little as 15 minutes. Fry them up in canola oil, add a little salt, and enjoy. Definitely trying these tomorrow. Always had store bought ones and never thought of making them. You have inspired me to, Imma. Have some taro lying around at home. Imma for how long do they stay crispy? This looks so delicious! Although I’ve never had taro, I would love to try it! Akinyi, I have only used a mandolin- there should is none that I know of. I’d recommend an electric mandoline. For larger taro, you could use a deli slicer, but that would probably be excessive. I love taro chips. I live in Hawaii and there are a few places that make taro chips. I first had fresh made taro chips when my husband brought some home with salsa from some restaurant/grill. They were mixed with sweet potato chips too and so delicious. Your chips look great. I dont think Ive ever had taro chips! Will have to try these one day. This is fantastic and not a lot of people know about Taro but I am thrilled you have discovered it!